We don’t have to stress how important it is to keep your computer safe these days but we’ll do it anyway. 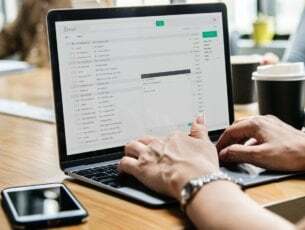 Whether a virus, Trojan horse, spyware or malware, your personal data is always under attack and this makes it increasingly important to have the best line of defense available. Most antivirus suites come with a Tune Up utility included that makes sure that makes sure to keep your PC’s performance as high as possible. These apps dig deep into the system and fix troubled areas. There are tons of antivirus tools with Tune Up features included out there, but some of them are more effective and secure than others. We gathered the best five antiviruses with tune up tools on the market to make your choice much easier. Bitdefender is one of the best antivirus software due to its performance, security-enhancing features, usability and non-stop tech support. 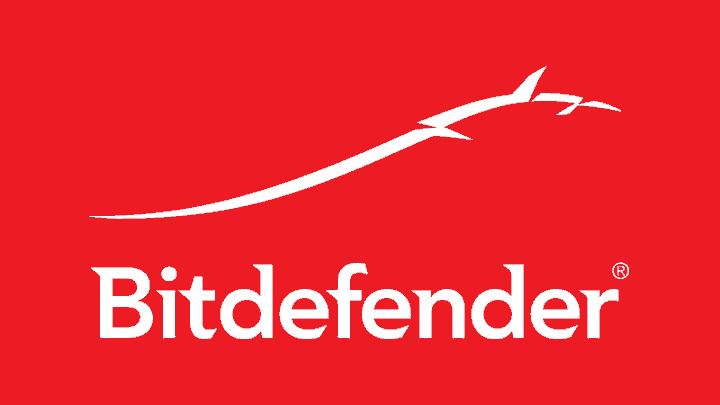 Bitdefender is the best antivirus software for systems running Windows 10. It comes with more features and tools in its basic package than any other antivirus product, and it also includes features to clean up your PC. Bitdefender’s download and installation processes involve more steps, but they’re easy to go through. The program comes with a clean and easy-to-use interface. Bitdefender examines files that are suspiciously similar to those already known to be malicious. This is a great tool to protect against new threats that pop up and target sensitive files. The USB Immunizer blocks potential malware in flash drives. Bitdefender also protects your social network by monitoring your privacy settings. Another great feature is vulnerable software detection. The tool also comes with a gamer mode. Bitdefender also includes tools to keep you safe while you bank online. It also comes with parental controls and mobile security tools. The PC Clean-Up from Bitdefender improves the system performance by removing the files that are no longer necessary such as temporary Internet files, cookies, and temporary system files. Bitdefender’s impressive performance, useful features, and solid support along with the excellent user experience make this tool an excellent antivirus program. t will cause minimal slowdowns because it scans your computer and it also includes a gamer mode so you can suspend the scans while you’re playing games and watch videos online. BullGuard is an efficient antivirus program that detects malware, and it also distinguishes between safe and malicious files. This is one of the best internet security suites regarding performance, features, support, and help. BullGuard also provides a main section for PC Tune Up. It protects your system from malware and phishing attacks. It doesn’t come with a password manager, file shredder or virtual keyboard. It comes with antimalware, antispyware, anti-phishing features and email and instant messaging protection. It also provides safe browsing and antispam. It offers automatic scanning of removable media and social networking protection as well. It also comes with a firewall. BullGuard provides a bootable rescue CD. It comes with a gaming mode that suspends alerts while you are playing your favorite games. It also comes with online backup and parental control. The PC Tune Up checks your computer for performance issues, and it optimizes the problems found in the scan. 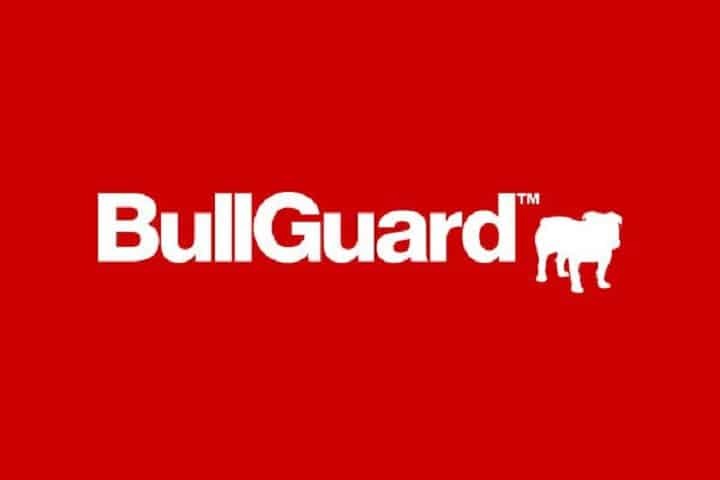 BullGuard is among the top Internet security suites due to its huge pack of features. Its accomplishments during all kinds of tests have shown how far above the average this antivirus is in all the areas that matter most to determine Internet security ranking. 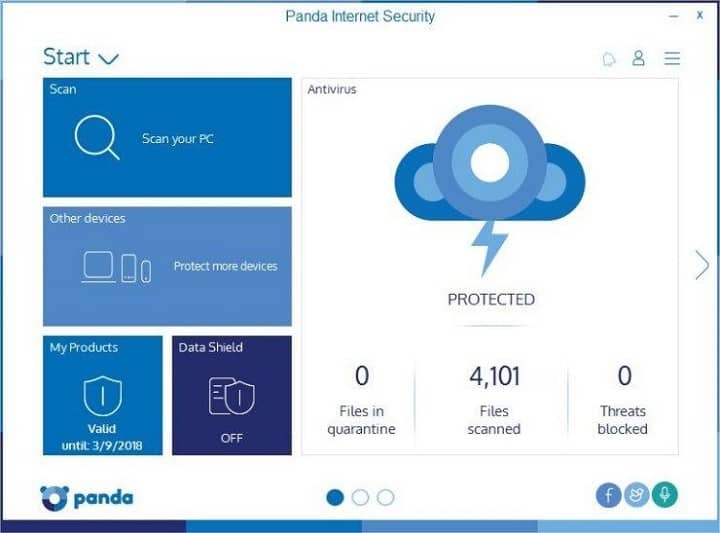 Panda Internet Security comes with a safe browser, and it features an innovative cloud-based antimalware technology that provides excellent protection against both known and unknown virus threats. It includes the PC Tuneup feature in the Global Protection and Gold Protection. It comes with parental controls, a firewall, a safe browser, email protection and a network manager. Its protection against Internet threats is excellent. It blocks most legit malware threats. Panda comes with some useful extras such as restoration tools, free online backup, and remote PC access. It also comes with tools for identity protection and contact information protection. The software includes a virtual keyboard for hiding your login info from keyloggers. There is also a tool for removing infected files from externally connected devices including USB drives. 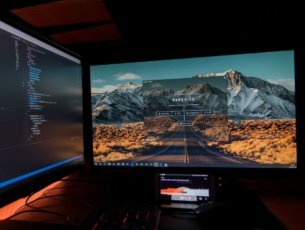 The safe browser is a virtual machine, and this means that it runs completely isolated from the PC. The safe browser provides a safe zone for online purchases and for exchanging sensitive info. The PC Tuneup features can free space on the PC, and it also comes with a Boot Manager and Defragmentation features included. The Panda Internet Security suite has quite a reliable record for malware detection, and it includes a useful toolset that will protect your system’s identity. Panda can rival the best Internet security software when it comes to detecting malware. Norton Security PC Tune UP will help you get the best out of your system because it provides outstanding antivirus protection, but it also strengthens your PC by helping enhance its performance. You don’t have to rely on separate software anymore, and instead, you can enjoy the one-click convenience of this software. Norton fixes common issues that cause undesirable behaviors such as freezing and crashing the system. It scans, diagnoses and resolves all kinds of issues and you won’t have to worry about complicated settings or to monitor its progress. It helps you remove unnecessary files that take up space on your hard drive. It frees up system memory, and it helps you make the most of your hard drive and RAM. It provides your system superior performance, and it also helps you browse, scan files, and protect your computer. Norton combines some of the most robust antivirus technology with a full suite of optimization tools and data protection. 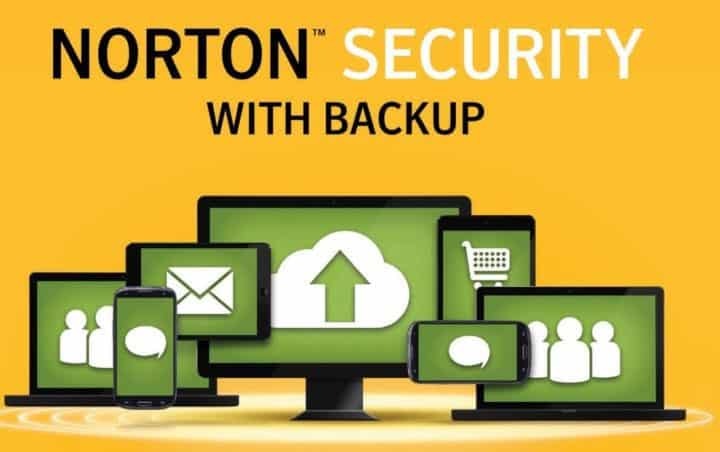 To learn more about the program and to get started right away, all you have to do it buy and download it from Norton Security Online. AVG TuneUP makes your PC live longer. The more programs you use, the slower your PC will become. The 2017 release of AVG Tune Up comes with a complete reboot of the parental Programs-On-Demand technology. It places draining programs into a smart Sleep Mode, and it reduces their impact on PC performance, battery life, storage and network to almost zero. It provides 77% faster boot time. It offers 75GB more as free space. You will get 108% longer battery life. 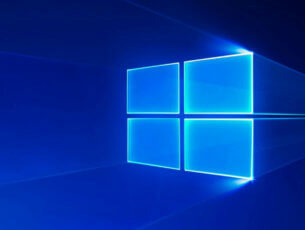 The program also provides constant updates for popular applications such as Skype and Google Chrome. It comes with a fully automatic updater. It comes with notifications for critical software updates. The software provides the most potent PC Cleaner. AVG PC TuneUp removes unwanted files that accumulate over time. The software can remove temporary files in Office 2016, Snagit, Windows 10 and more. It removes hidden browser traces from the latest IE, Chrome, Edge, and Firefox. It can also eliminate unnecessary Windows cache and logs and duplicate photos, docs and more files. 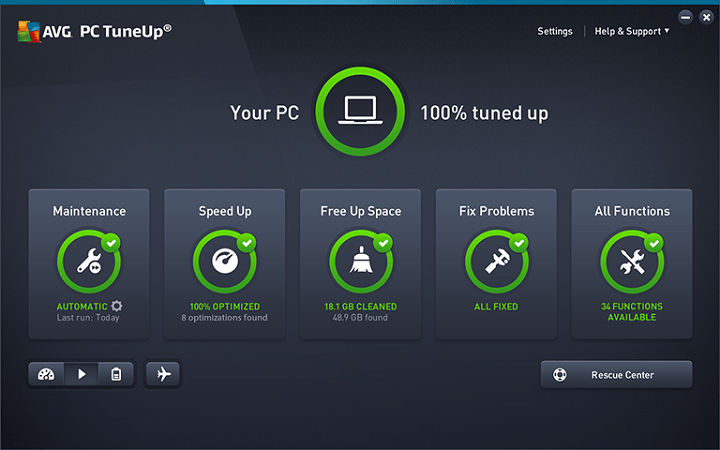 Download AVG PC TuneUp from the official website. These are the best five antivirus tools with tuneup utilities that you will find on the market. Check out their features and go with the one that fits your needs best.